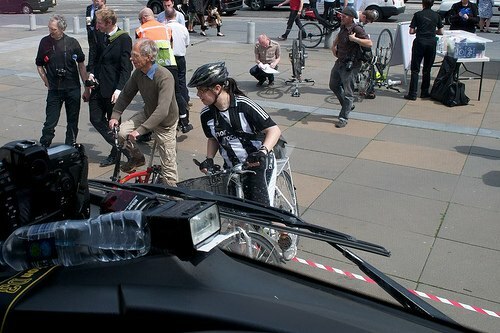 As part of National Bike Week, Spokes and various other stakeholders got together to cordon off Festival Square on Lothian Road for a sort of large-vehicle-danger seminar. 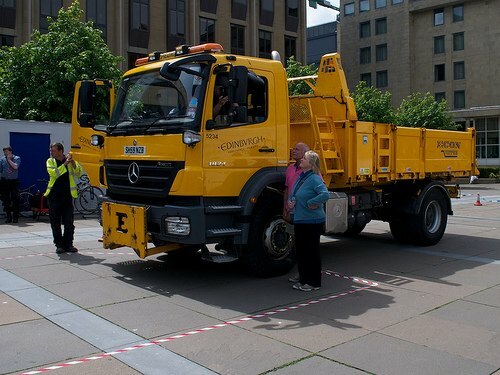 Present was a council tipper, not a bin lorry – perhaps wisely avoiding uncomfortable questions over the death of Craig Newton, who was tragically killed last year when the driver of an Edinburgh Council bin lorry drove over him in broad daylight. Nevertheless I found the experience of sitting in the driving seat to be extremely enlightening, if not perhaps for quite the same reasons the organisers might hope! Above you can see the tipper with a taped area laid out in front of it. 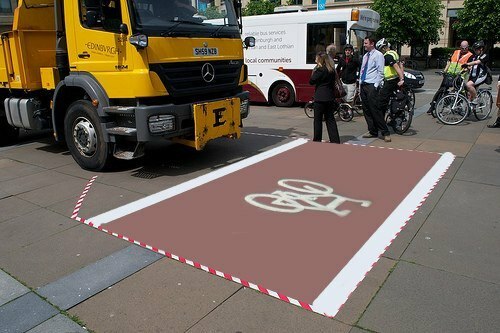 Compare the taped area with a cycle safety box as found at many junctions: looks pretty similar, doesn’t it? It goes without saying that anyone professionally engaged to drive a large vehicle in close proximity to vulnerable members of the public is under huge responsibility not to kill any of them. This is why you will never find lorry drivers, who are aware of the limitations of their vehicles and the dangers they pose, creating deadly situations by illegally encroaching on cycle safety areas at junctions… right? That’s why Lothian & Borders Police rigorously enforce the observation of cycle safety boxes and pursue professional drivers who endanger life by illegally encroaching on cycle safety areas… right? Anyway, I digress! The next photo sets the scene for the most interesting experience of the morning, in my book. Here you can see the parents of Andrew McNicoll standing more or less exactly in the ‘killing zone’ on the inside of the tipper. (Andrew was an expert rider who was tragically killed on Edinburgh’s streets; a truck driver was later arrested away from the scene – see Andrew Cyclist). I jumped into the driver’s seat to see what he/she would be able to see from a normal driving position in the nearside mirrors. To my great surprise, you can clearly see both the McNicolls in the ordinary side mirror as plain as the nose on your face. 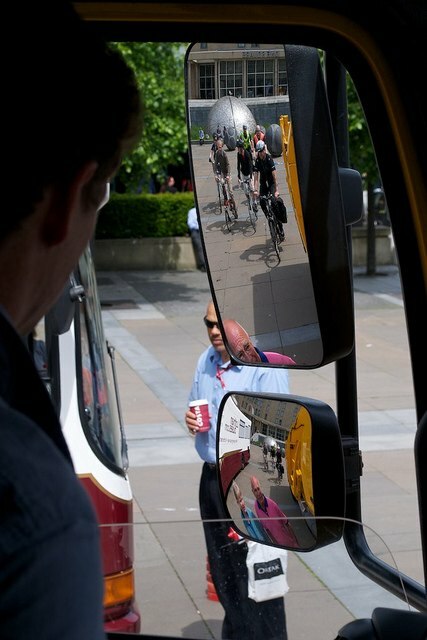 You can even see, very clearly, cyclists coming up the inside of the truck from quite some distance behind as part of the photo shoot. Oh. The side mirror not only shows the McNichols at the back of the cab as clear as day, it shows everything in great detail right out to the front of the wagon! Not much place for a cyclist to hide there, especially as the professional driver, knowing he represents under 5% of traffic movements but is involved in 2/3 of killings, will be especially careful to check those mirrors before swinging left. What if the cyclist is out in front of the truck though, in the middle of the safety box (as advised by numerous sources including the IAM and Bikeability)? 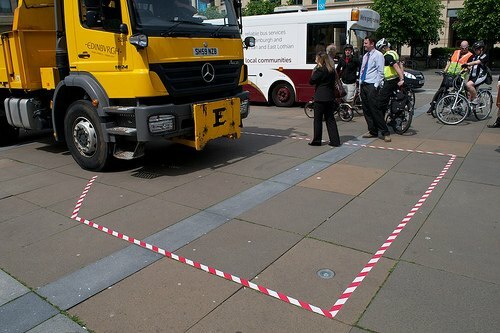 What if the lorry pulls up to a safety box right behind a cyclist, although not on top of them (yet) – what will the driver be able to see? Crikey, yet again there’s a mirror which covers this exact area. 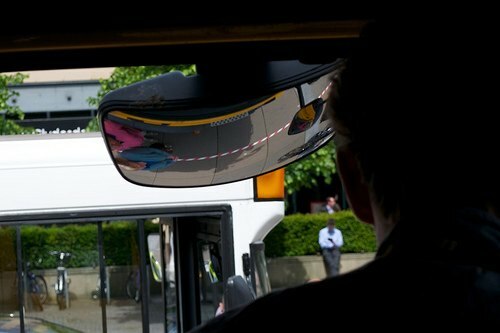 In case anyone offers the appalling excuse that not every driver has the full complement of “basic safety mirrors” fitted, they’re not called “basic safety mirrors” for nothing you know. 66% of urban deaths involve a heavy goods vehicle remember – no driver or company can claim ignorance when it comes to their priorities towards public safety. The police, CPS/fiscal and judiciary would never accept that an absence of “basic safety mirrors” leading to a preventable collision by the driver was anything other than a serious aggravating factor against a backdrop of ongoing deaths in these situations… right? They’d never let a killer driver off the hook because his sub-legal complement of mirrors is seen as a mitigating factor… right? Above you can see the plain vanilla view out of the cab. The line on the ground seems to be where the dash obscures the ground. It’s actually extremely easy to see cyclists who are in this area, and there can be no doubt that a lorry driver who kills someone in a botched overtaking attempt is, in common with all “hit from behind” killings, almost automatically responsible for the life they’ve taken. Thanks to both the Council and Lothian Buses, Spokes, Lothian and Borders Police (for this at least! ), CityCyclingEdinburgh and everyone else involved in National Bike Week activities… food for thought I hope. Look at the limited vision of this lorry in Russia. Take a look at the newer vehicles being used in Edinburgh – almost all have walk-in cabs with the driver at eye-level with those outside. The current regulations make the design of typical trucks so dangerous that changes being promoted by T&E a lobby group are reckoned to be set to save over 3000 deaths/year on Europe’s roads, through better direct visibility (mirrors and cameras are indirect and far less effective – especially when they need to be maintained and adjusted to work properly), and a design which throws a pedestrian or cyclist clear on impact rather than knocks them down ready to be run over. thanks for this piece. wish i’d gone along to the large vehicle display. interesting bus training video also – a good reminder to me to keep out in the road whilst moving; despite umpteen years of cycling cities, I tend towards riding too far left, in the door zone, possibly out of fear of the unknown threat behind me. As wage levels fall dramatically within the transport industry, largely due to the lifting of cross EU employment restrictions a few years ago, there is enormous pressure to drive for much longer hours to make up wages as the hourly rate is progressively cut. I’m not judging, but the reality is that there are a lot of very tired drivers out there. There seems to be a far more aggressive attitude to making progress on the roads these days, whether it be other motorists, pedestrians, or indeed cyclists. If you add to the mix a very real risk of hijacking of high value loads, and the ever present possibilty of “cash for crash” scammers (who see lorry drivers from blue chip firms as an easy target) you can see that the pressure is on. And it gets worse: the relentless increase in traffic restrictions, the ever present desire amongst local authorities to create situations where they can make money by imposing “fines” (box junctions and over zealous parking penalties, for instance) and tighter delivery windows as companies try and maximise operating profits per vehicle, perhaps at the expense of road safety, all conspire to make commercial driving much more difficult than it has ever been before. And all of the above is before you’ve even factored in the constant phone calls from the depot, the resolution of re-routing on the fly, to respond to traffic incidents and unexpected road closures, and their mathemtical effect on the requirement to comply with complex regulations concerning weight, vehicle height and drivers’ hours limits. But this is the big one – are you ready for this? There appears to be an expectation that we can observe the sometimes rapidly changing situation around our lorries, by monitoring three windows and perhaps nine mirrors, across a 180 degree plane, all at the same time, and sometimes when it is raining or at night, and with plonkers all around us seemingly involved in an “arms race” to see how bright they can make their lights. The idea that we are all seeing is a facily, and a potential fatal one at that. And, if all this isn’t enough to make cyclist realise how much danger they’re in, they should know that lorry drivers are often obliged to work 15 hours shifts, with reduced sleep, and disrupted sleep patterns, so their reactions may be slower than you expect. I try not to drive when I’m tired, but this is the reality of the situation in the UK today. I suspect that most car drivers would be in difficulty if they drove for that long, and I’m certain that I’m not exactly as bright as a button myself if I’m 15 hours into a bike ride. It has been a considered view, that lorry drivers often have to cope with more “inputs” and “outputs” than a jet fighter pilot, and I suspect that many people simply wouldn’t have the cognitive capacity to drive a lorry safely, so we need to understand that the situation is far more complex than just adding an extra mirror here and there. So, what avice, as a lorry driver, can I give to my fellow cyclists? 1. Accept that if a lorry is stationary, a pedestrian may be about to step out from the front of the vehicle, so resist passing at full speed when it’s perfectly obvious that you could run straight into the path of that person. 2. Realise that your light is just one of a sea of lights, and offers you surpisingly little visibility, especially from the oblique angle created when viewed from a cab. 3. The “urban look” is dumb from a safety point of view. Not making any judgements here, but you’re far more likely to be noticed if you’re wearing a “Hi Vis”, partly through enhanced pheripheral visibility (remember, we can only glance at one mirror at a time) but also because lorry drivers are phsycologically tuned to spotting you if you wear one. A Hi Vis is probably the single biggest improvement to personal safety you can make, day or night. 4. Use peer pressure to stop cyclists from squeezing up the left hand side of a lorry, but also recognise that the same thing applies to squeezing up the right hand side too. After all, how do you know if the lorry is right hand drive or left hand drive? 5. Recognise that many lorry drivers simply don’t realise that cyclists can be quite fast, so, if a lorry starts to overtake, and you realise the driver isn’t going to clear you before pulling back in at the next pinch point, resist that urge to “race” the lorry in order to make a point. You wouldn’t do it in a car, so why do it on a bike? Let it go and just overtake (with care) at the next queue of staionary traffic. 6. 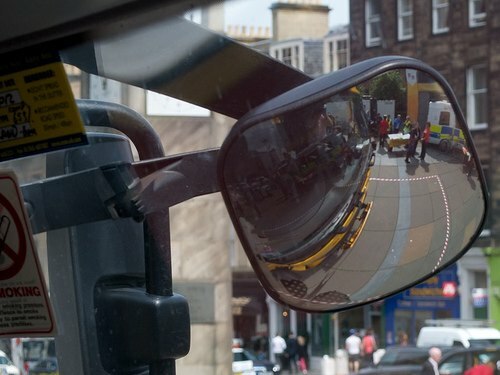 Recognise the differnce in the view from the left hand mirror of an articulated lorry when compared to a rigid lorry. Once the aticulated lorry starts to “bend”, there really is a massive blind spot that could kill you. 7. Some lorries have “steering” rear axles, so don’t assume all lorries will follow the same “track” around a bend. 8. No matter how tempting, don’t draft a lorry, pretending you’re trying to get back to the peloton after a wheel change. You simply don’t know where the potholes are going to be. 9. Recognise that it is impossible to know, until the inquest into the death of a cyclist, just how much pressure the driver was under at the time of the incident, or indeed how able the driver was to cope with the whole (potentially overwhelming) multi-tasking process. So DO NOT ASSUME that the driver has seen you, just because theoretically they can. There are good and bad lorry drivers, just as there are good and bad cyclists, but I know that my colleagues are very aware of cyclists these days, so I’m hoping that this perspective is helpful. Watching the “The Shadow Cyclist Vs Bus” video above shows very clearly why Holland and Denmark decided to invest in real bike lanes, where cyclists don’t have to share the road with motorized vehicles, especially buses and HGVs. Since very few countries in Europe have oil, the only explanation I can think of to explain this lack of political will is that most of them have a car industry… unlike Holland and Denmark. But with peak oil pretty much here, this might change. You sum up the idiocy of these kind of exercises when you point out the tape is placed where the dash obscures the *ground*. They are attempting to simplify a three dimensional field of vision onto a 2d plan which is not at right angles to the direction of view. Unless the cyclist is very thin and lying on the ground (which is not how I wait for the lights to change it’s meaningless). Of course these exercises are done with good intentions. Nick is absolutely right to point out that the driver can’t look in all directions at once. Even if the driver could (and maybe should) have seen you that’s little consolation as they drive over you. So I’m not advocating squeezing past lorries in adverse conditions. I imagine the organisers might argue the tape gives at least an indication of the driver’s blind spots. But it’s so misleading I find it disingenuous. Of course what we should all – cyclists, lorry drivers and anyone who wants a safe environment to get around in – be shouting for is infrastructure which doesn’t force the smallest most fragile forms of transport to share with the largest, most dangerous, and most clumsy. why where you clearly sitting in the passenger seat when taking the pictures surly to get a proper drivers perspective of the view you would have been in the driver seat. Please see this case. many contributing factors here.